Wow, look at that! It’s Saturday and I actually have a post up. I don’t really post on weekends but I had to share this. 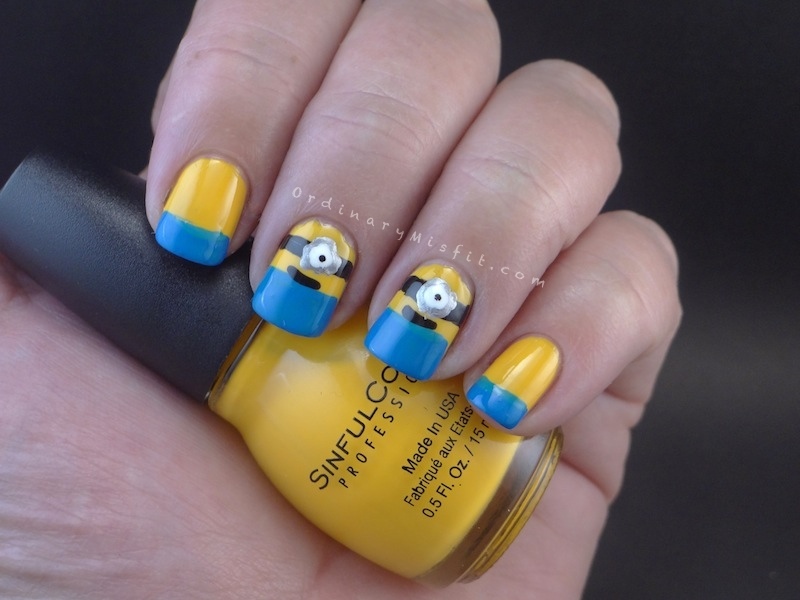 Earlier today my (baby) cousin Jamcj sent me a pin on pinterest for Minion nails and said if I did them I would be super cool in her eyes. Challenge accepted!! I also recently saw this adorable and easy tutorial from Cutepolish. So I gave it a shot. 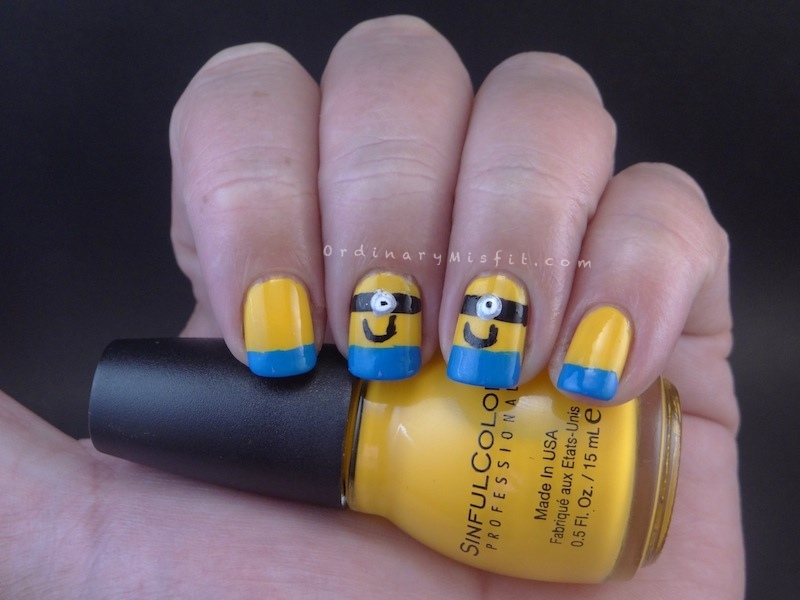 The Minions are my favourite part of the Despicable Me movies. They are so adorable and I definitely need a few of my own. For this look I used 2 coats of Sinful Colors – Pull Over. Pull Over is a gorgeous yellow that is super easy to work with. I then used Sinful Colors – Why Not? I used Why Not? for the blue tips. I used the polish brush and then just rotated my finger. Exactly the way CutePolish describes it in her tutorial and it worked quite well. I then used my black striper to make the wider black line that forms part of the ‘goggles’ and for the (very wonky) smile. I then used Sinful Colors – Casablanca for the first silver big dot for the eye. When that was dry I used Sinful Colors – Snow me White and made a smaller dot on top of the silver to make the eye. When that was dry I used my striper brush to make the small black dot for pupil. When that was all done I added a thick coat of topcoat – so as not to smudge anything – and I was good to go. I must admit, this was my second attempt. The first attempt I made the blue tips too big so there wasn’t much space left for the ‘smile’. I also totally messed up with the eye. Here is what my first attempt looked like. What do you think? 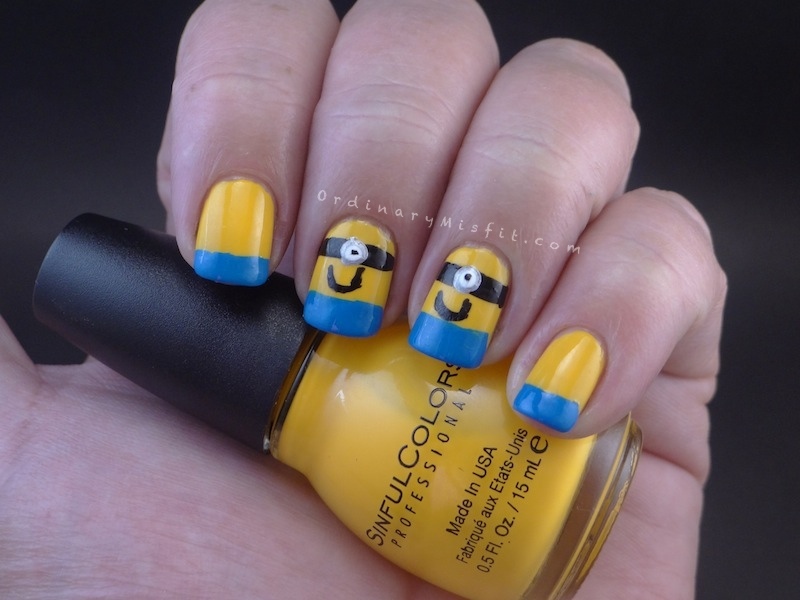 Do you also love the cute little Minions? I would love to have a few real life Minions running around. So much fun! My sister is going to love this! Charlene recently posted…Feel Good Friday! Aw, how cute you did these for your cousin! A two-coater yellow?!?! That’s magical! I’ve never seen the movies, even though everyone has said good things. I seem to have had really good luck with the yellow. It’s one of my faves formula wise. I haven’t seen the second one yet but loved the first one.